On August 8 at 0318 UTC (Aug. 7 at 11:18 p.m. EDT) the Visible Infrared Imaging Radiometer Suite (VIIRS) instrument aboard NASA-NOAA's Suomi NPP satellite captured visible image of Shanshan nearing Tokyo, Japan. The VIIRS image showed that Shanshan had powerful thunderstorms surrounding the center of circulation and in a large band of thunderstorms wrapping around the storm. 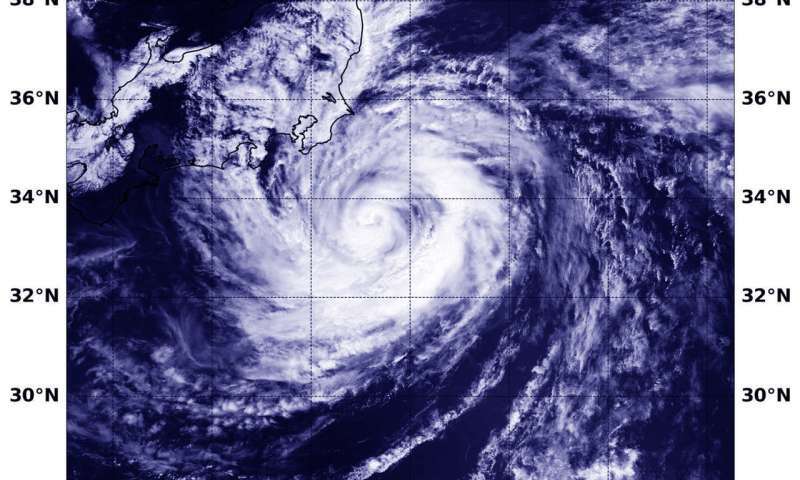 On August 8 at 11 a.m. EDT (1500 UTC), the Joint Typhoon Warning Center or JTWC noted that Typhoon Shanshan was located near 34.5 degrees north latitude and 141.3 degrees east longitude, about 92 nautical miles east-southeast of Yokosuka, Japan. Shanshan had maintained maximum sustained winds near 70 knots (80.5 mph/129.6 kph) but is on a weakening trend. The JTWC expect Shanshan's western quadrant to affect Tokyo while the center of circulation stays off-shore. Then Shanshan is forecast to curve northeast and move away from the Big Island.